On March 11, 1776, from his headquarters in Cambridge, Massachusetts, Washington issued a General Order directing Colonels and Commanding Officers of regiments of the Continental Army to select four men from each regiment who would form his personal guard. 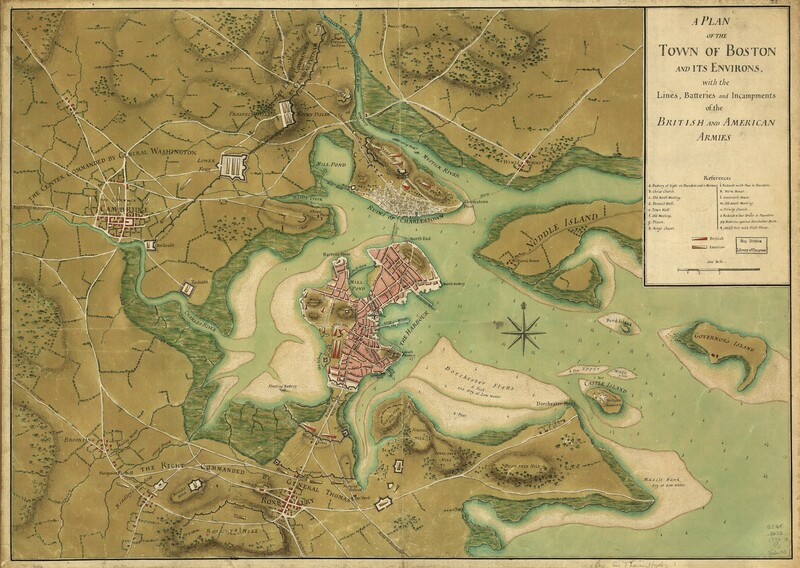 Use this 1776 map from the Library of Congress to see the Siege of Boston from a contemporary viewpoint. In June 1775, George Washington found his thoughts turning to Mount Vernon. He had promised his wife Martha that he would return soon from the Continental Congress in Philadelphia. But his fellow delegates had just elected him the Commander-in-Chief of the Continental Army, and he was bound for Boston. Militia companies trapped the British on April 19, 1775 following the battles at Lexington and Concord. Upon arriving in Cambridge in early July, Washington proposed an attack on Boston. However, his officers were against it. They argued that the British were still receiving supplies by sea. They urged Washington to wait until the waters around Boston were frozen. Washington sent an army instead to Quebec. He also ordered Henry Knox to march to Fort Ticonderoga and bring back the post's artillery. While the attack on Quebec failed, Knox returned to Cambridge in January 1776 with fifty-nine cannons. Howe sent troops up Dorchester Heights to dislodge the guns, but a snowstorm prevented the assault. Fearing a brutal bombardment, he decided to leave Boston. On March 17, 1776, known afterward as "Evacuation Day," 11,000 redcoats and hundreds of Loyalists left the city by boat. Washington marched into Boston on March 18, but there was little time for rejoicing. He rightly suspected that the British would head for New York City. As he prepared for the next test of battle, one of his few comforts was the fact that his wife Martha had joined him in November. They would go together to New York, hoping that no harm would come to their beloved Mount Vernon. 1. "George Washington to Martha Washington, June 18, 1775," The Writings of George Washington, Vol. 3, ed. John C. Fitzpatrick (Charlottesville, VA: University Press of Virginia, 1931). 2. Quoted in David McCullough, 1776 (New York: Simon & Schuster, 2005), 93. George Washington: Writings. ed. John Rhodehamel. New York: Library of America, 1997.